In today’s economic climate, businesses need to be smarter about how they govern investments in new initiatives and sustain their existing project and application portfolios. Reducing or eliminating investment in non-strategic projects and resources enables businesses to both simplify and focus attention and investment on delivering innovations faster and with more agility, accelerating delivery of IT services to the business. 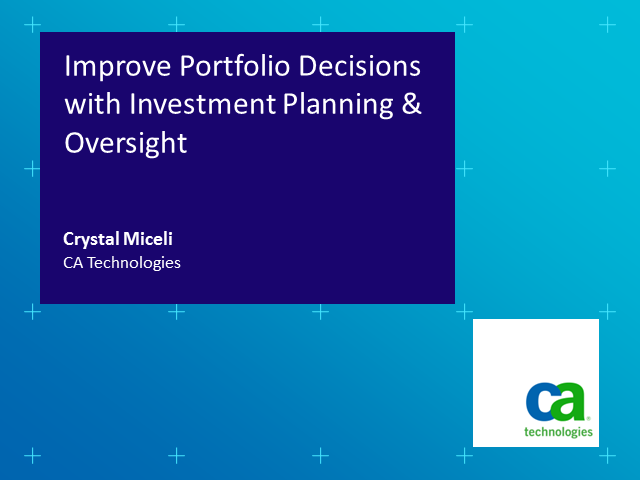 Join this webcast to learn how CA Technologies’ solutions provide business leaders portfolio management capabilities to collect all requests for new services and projects, make improved decisions regarding how to invest, and best optimize the service and product portfolios based on costs, risks, business value and compliance.